We are happy to ship parcels outside of Europe please contact us via email or the "contact us" page above to obtain a quote. Goods in the UK are sent by first class with Royal Mail. - FREE delivery for orders over £40.00. We may occasionally use a courier company, however, we will not be able to specify a delivery time. If you require your items to be sent by recorded/signed for or special delivery/next day please contact us on 01273 694479 or email us at: sales@pardonmyfrench.co.uk , there might be an extra postage charge for these services, we will quote you once we have your details. We usually post everything as soon as an order is received however, please allow 2-5 working days from ordering for delivery of goods, orders placed at the weekend, on Bank Holidays or after 12pm on a Friday, will not be processed until the following working day. If a delivery address is outside of the UK you may have to pay import duties or taxes when the goods arrive at their destination, we will not be held liable for these costs and it must be your responsibility to fill in all the necessary paperwork and pay any fees due. * Please note deliveries to the Channel Islands and Isle of Man may also be subject to import duties, taxes and delays due to customs checks and some services may not be available or subject to different guaranteed delivery times. We cannot be held liable for delays in delivery due to delays by Royal Mail or any other unforseen circumstances. In the unlikely event that you are not completely satisfied with your goods, you may return them if they are unopened and still in the original packaging within 7 days of purchase for a full refund, however, all return postage fees and packaging will have to be paid by you. If an item arrives damaged please email us: sales@pardonmyfrench.co.uk and return the item to us in the same condition within 7 days and we will then arrange a refund or a replacement. You will have to obtain "proof of posting" from the post office as we will not refund or exchange returned items lost in the post without "proof of posting". 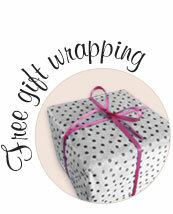 Free gift wrapping service on all items! Gift tags are available with a short message for £1 per item, please select from your basket. We reserve the right to use any type of gift wrapping materials we have available and cannot be held responsible or liable if the gift wrapping is not to your liking or has been damaged in transit. Small items will be wrapped together, please contact us if this is a problem.